Founded in 1986 and based in New York City, Sarah Merians Photography and Video Company is the premier boutique wedding, social and corporate event photography studio in the Tri-State area. Over the past 32 years, we have grown into a full-service studio for all stages of our client’s lives. Our mitzvah children have become our brides and grooms, and our brides and grooms have continued to return with their new and growing families. From belly to boardroom, we truly capture life at its best! Weddings & Mitzvahs, our first division, evolved out of Sarah’s love for capturing these milestone events. Over the past two decades, as client accolades have grown, so has our reputation and our team of talented photographers. Kids & Family came about through both Sarah’s love of children and her strong relationships with her brides and grooms. It was only a matter of time before Sarah was invited to photograph their growing families with the same creativity and care that made their wedding photos and albums so exquisite. Families are about generations, and the generations help us to weave a story and leave a legacy for our children. We are so thrilled to be there for our clients as they welcome their new generations into the world. This division is where kids and photography click! 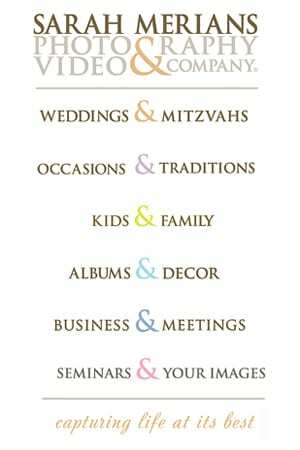 Occasions & Traditions covers all life’s special events beyond weddings and mitzvahs. From Brises, christenings, Baby namings, sweet sixteens, milestone birthday parties and family reunions, this division enables us to continue celebrating with our clients. These events are only small happenings over the course of a lifetime, but are equally special. Whether these gatherings take place at a restaurant, catering hall or your home, special events with your friends and family should be remembered forever. Professional photography and albums create heirlooms that can be passed down from generation to generation. Albums & Décor grew out of our clients being thrilled with our intimate design process and the premium quality of our albums. Clients shared their albums with their family and friends who then told their family and friends. When these prospective clients began to bring us piles of pictures asking us to turn the chaos into tangible memories, we realized that there was a huge void in the industry and we were happy to help. Whether they had received a CD only, their photographer disappeared or they were just not satisfied with their photographs, we were and are thrilled to be a part of the solution! Albums & Décor provides us the opportunity to celebrate even amateur photographers who have a love of photography and want us to help them create spectacular products with their own images. Honeymoon and vacation photos are a perfect example of special memories we can turn into albums, frames and even custom photo art for your home. Every one is a photographer today, and we have decided to continue doing what we do really well, and that is to be leaders in the industry and design and decorate homes and preserve memories regardless of who shot the event. We have the finest quality and a keen sense of eye for design. It is easy to take a photograph, but most important to preserve the memory in a tangible, creative and simple way! Seminars & Your Pics – With the advent of digital photography over the past decade, many people have taken a personal interest in photography. We have always embraced our customers’ photographic needs and are often asked advice on what camera to buy and/or how to take a great photograph. It was only natural to unite our talented professional photographers with those clients who have a passion for taking pictures. We are happy to teach, share and help produce products for the amateur photographer. Business & Meetings – This division grew out of our accomplished and successful clients, who inquired often about corporate photography for their own professional and business needs. Corporate needs range from headshots, and website development to large-scale events such as product launches, fundraisers, business meetings and company retreats. Our company has grown into so much more than simply snapping a photo. The “&” in each of our divisions represents the company we are today. We want to be in our client’s lives for a lifetime, as opposed to just one, singular event. This special relationship we foster with each and every one of our clients, in addition to the wide range of products we create and services we offer, is what sets us apart from other photographers. We are photographers & so much more! We want to thank our clients for sharing their personal images with us and others and for your commitment to sharing your family with us through the years. Sarah Merians is a unique combination of artist and professional. She is incredibly talented, hardworking and knows her business. We have worked with Sarah at our family’s ‘life events’ and now consider her one of the family. You can count on Sarah for a lifetime of memories. The miracle of Sarah Merians is that her work only gets better throughout the years. Her enthusiasm and craftsmanship improves with each event, where she captures the true essence of the event. I’m speechless. In my wildest dreams I could not have imagined being able to relive the evening through pictures, but you proved me wrong. As I see you noticed, there was a moment in the evening when I became a bit emotional. The thought of being there, with Brandon and my family at his Bar Mitzvah celebration was too much for me to handle. I lost it. I guess that’s the difference between you and every other photographer on the face of earth…you got it!!! In that split second when my guard dropped, you were there to capture it. You have preserved forever one of the most special moments in my life. I can’t thank you enough for bring there for us. Bill and I want to thank you for the amazing photographs!! We just received our album and it is absolutely beautiful! You captured the day wonderfully and it was such a pleasure working with you. Your sense of humor was refreshing and kept us all smiling. Our memories would not be the same with out Sarah. She captured the essence of both our daughter’s Bat Mitzvahs. With an engaging personality and incredible spirit, she puts everyone at ease. We look forward to Sarah capturing the same magic for our daughters’ weddings. Oh my GOODDDD!!! I got the proofs today. AMAZING!!!! You did such an amazing job capturing my little family!! Jacob looks as fantastic in those pictures as he does in real life, and that is definately not something we have been able to capture with our camera. Thank you so much, Sarah. I am in love with these pictures and I can’t wait to pick some out to give our parents and decorate our home. Tina did a wonderful job photographing our day; Brendan and I couldn’t be happier. We look forward to receiving the album proof in the coming weeks. I am on the floor in tears. [The montage] is perfect.. perfect..perfect. Thank you SO much. You are the best, an absolute peach to work with, and I am beyond grateful for this gift of your talents. I wish you all could feel the gratitude I hold in my heart for each of you. Last night truly gave the word perfection a whole new meaning. I keep receiving accolades from my friends and family, and we all are walking around today in the glow of one amazing evening. Each of you played a significant role in making our special night one of the most memorable of our lives. Your hard work and attention to detail did not go unnoticed, and Greg, Alex, and I- along with the rest of our family- thanks you from the bottom of our hearts. I can’t thank you, Liel and your team enough for capturing the most amazing event for our memories. I cannot wait to see the pictures. Having you personally there meant so much to us. Thanks again! “Thank You for everything!! You are truly a rockstar!! Would never do an event without you!! Love you!